Swala Energy Ltd (ASX: SWE) has identified a strong prospect to be drilled with JV partner Tullow Oil at its Block 12B in Kenya. SWE and Tullow both committed to drilling at Block 12B in Q2 of 2015 after a recently completed 2D seismic survey identified ten structural leads. A drilling prospect called Ahero ‘A’ has been selected as the most viable to begin with. Block 12B in Kenya is highly prospective for oil and exploration by SWE and Tullow indicates that it has a basin with layers of sediments that could hold hydrocarbon reservoirs. The 2D seismic survey recently at completed at 12B identified ten structural leads while also mapping the basin. 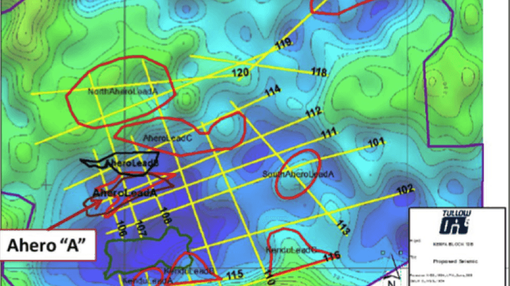 SWE says the Ahero ‘A prospect’ is an area of 16km2 that’s been transected by five lines of 2D seismic. SWE regards it as the first viable drilling target for its 2015 exploration programme. SWE’s Chief Executive Officer David Mestres Ridge says the drilling at 12B is just the beginning for his company’s plans for 2015 in Africa. ‘We are very excited at the decision by the remaining parties to drill Ahero “A”, one of a number of prospects identified in Block 12B and which our technical teams are continuing to investigate. With our recently announced successful 2D seismic survey over the Moshi basin and the upcoming seismic survey in the Kilombero, both in Tanzania, we are on track to develop a significant portfolio of leads and prospects to be tested in the coming year,’ he says. This decision to drill comes after SWE’s $36M farm-in deal with the Abu Dhabi government owned explorer CEPSA fell through after the company withdrew from the Block 12B development, saying it would have preferred more time to review the 2D seismic data. SWE says its wholly owned subsidiary Swala Energy Limited has referred a dispute with CEPSA to arbitration, to ensure that the 25% project share that was farmed out is returned to SWE in full and in accordance with the Farm in Agreement. SWE is exploring for oil across the East African Rift System with projects in Kenya, Zambia and Tanzania where it’s just completed a 200km 2D seismic survey over the Moshi Basin. SWE says the survey has identified a number of potential structural leads, which will be further investigated to pick drilling targets for exploration in 2015. Another 450km of 2D seismic is now being shot by SWE over the Kilomebro Basin, which sits to the south of the Moshi Basin. The Kilombero Basin holds the massive Kito prospect, which has an independently assessed potential un-risked resource of 110.5M barrels net to SWE. The new round of 2D seismic in the Kilombero Basin will focus on the immediate area at the Kito prospect and aims to firm up drilling targets for 2015.